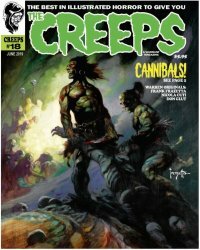 MyMovieMonsters.com > Comics - Archive Books > The Creeps > The Creeps comic magazine #18 - Cannibals! - LATEST ISSUE! The best in illustrated horror! The Creeps magazine is now published bi-monthly and just like the issues of CREEPY or EERIE that you purchased years ago! Featuring the greatest horror writers and artists. Full color cover and B&W inside. Note: You must use the drop-down menu above to indicate whether or not you want this issue "bagged and boarded" (slipped into an archival-quality poly bag with backer board). We also carry back issues back to #2 while they last.